One way to do web performance research is to dig into what's out there. It's a tradition dating back from Steve Souders and his HPWS where he was looking at the top 10 Alexa sites for proof that best practices are or aren't followed. This involves loading each pages and inspecting the body or the response headers. Pros: real sites. Cons: manual labor, small sample. I've done some image and CSS optimization research grabbing data in any way that looks easy: using the Yahoo image search API to get URLs or using Fiddler to monitor and export the traffic and loading a bazillion sites in IE with a script. 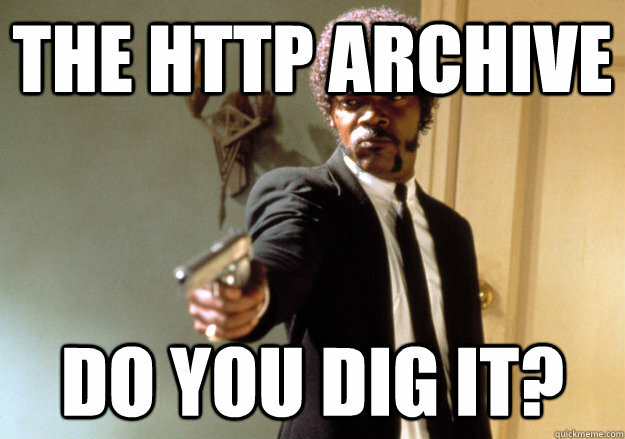 Or using HTTPWatch. Pros: big sample. Cons: reinvent the wheel and use a different sampling criteria every time. Today we have httparchive.org which makes performance research so much easier. It already has a bunch of data you can export and dive into immediately. It's also a common starting point so two people can examine the same data independently and compare or reproduce each other's results. Let's see how to get started with the HTTP archive's data. 5. Go the archive and fetch the database schema. Hm, I wonder what are common mime types these days. Limiting to 10000 or more occurrences of the same mime type, because there's a lot of garbage out there. If you've never looked into real web data, you'd surprised how much misconfiguration is going on. It's a small miracle the web even works. So the web is mostly made of JPEGs. GIFs are still more than PNGs despite all best efforts. Although OTOH (assuming these are comparable datasets), PNG is definitely gaining compared to this picture from two and a half years ago. Anyway. So this is how easy it is to get started with the HTTPArchive. What experiment would you run with this data?